A Delta 2 rocket launches the Kepler spacecraft from Launch Pad 17-B at Cape Canaveral Air Force Station in Florida on March 6, 2009. The space telescope will hunt Earth-like planets around alien stars. Thisstory was updated at 12:10 a.m. EST on March 7. 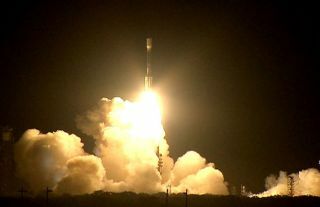 NASA?s newplanet-hunting Kepler telescope launched into space late Friday, lighting upthe night sky above Florida as it began an ambitious mission to seek outEarth-like planets around alien stars. Kepler blastedoff atop a Delta 2 rocket from the Cape Canaveral Air Force Station in Floridaat 10:49 p.m. EST (0349 March 7 GMT). The $600million spacecraft will gaze at a single region of our Milky Way galaxy forat least three years in a planetary census that, scientists say, couldfundamentally alter humanity?s view of its role in the universe. ?At the endof those three years, we?ll be able to answer, ?Are there otherworlds out there or are we alone??? said William Borucki, Kepler?sprincipal investigator at NASA?s Ames Research Center in Moffett Field, Calif.,before launch. Kepler separatedfrom its booster about an hour after liftoff and headed toward anEarth-trailing orbit that will circle the sun once every 371 days. Thesuccessful liftoff came on the heels of NASA?s Feb. 24 failure of a landmarkclimate-monitoring satellite, which crashed into the ocean just after launch. A planetlike ours ?out there? Named afterthe 17th century German scientist Johannes Kepler, who discovered the laws ofplanetary motion, NASA?s Kepler spacecraft will use those laws to seek outEarth-like worlds around distant stars. Thespacecraft will point its unblinking eye at a patch of sky near theconstellations Cygnus and Lyra, where it will scan some 100,000 stars for thetelltale dip in brightness that signals a planet crossing in front of itsparent star as seen from Earth. The tiny ?wink? in light that Kepler isdesigned to measure with its95 million-pixel camera is comparable to a person trying to watch a fleacross a car?s headlight from miles away, NASA officials have said. AstronomerGeoff Marcy, a Kepler co-investigator at the University of California atBerkeley, called Kepler a ?mission for the ages.? ?Kepler isthe first telescope ever conceived by humanity that can actually detect planetslike Earth,? Marcy said just before launch. Since 1995,astronomers have discovered nearly 340 planets beyond our own Solar System, butthe search has turned up mainly inhospitable worlds the size of Jupiter orlarger that circle parent stars in orbits too extreme to sustain life as weknow it. NASA hopesto use Kepler to sift through those planetary behemoths for the smaller, rockyworlds - like our own Earth - that happen to orbit their parent stars in aregion just right for liquid water to exist at the surface. ?Whatexists is an incredibly random, chaotic, you know, wild range of planets,"said Debra Fischer, an astronomer at the San Francisco State University who isnot directly involved with the Kepler mission, in a recent briefing. ?Kepler isreally going to probe the habitable zones of planets." The rangeof the so-called habitable zone, or Goldilocks zone, around a star variesdepending on the star?s size, but is generally considered to be the region inwhich liquid water - an essential ingredient of life on Earth - can exist atthe surface. Too close to a star and a planet is too hot, while too farout will yield icy, frozen worlds, researchers said. ?What wewant is a temperature that?s just right,? said Borucki. ?The so-calledGoldilocks zone.? With Keplernow in space, the work to outfit the telescope for its planet-hunting missionwill begin in earnest. Jim Fanson,NASA?s Kepler project manager at the Jet Propulsion Laboratory in Pasadena,Calif., said Thursday that flight controllers plan to spend the next two monthsperforming a series of tests to make sure Kepler is healthy and ready to work.If all goes well, the protective dust cover shielding Kepler?s telescope eyewill open about three weeks after liftoff. Missionscientists hope to begin spotting larger Jupiter-like planets first, and thennarrow the hunt down to Earth-like worlds as the mission wears on. While Kepleris designed to last about 3 1/2 years, it carries enough fuel to run for sixyears, they said. But first,NASA has to get the spacecraft into its planet-hunting position. ?We have alot of calibrations to do,? Fanson said.